Leland Stanford was born in March 9th 1824. His parents, Josiah and Elizabeth Stanford, were New York farmers. Stanford attended school until 1836 and was home schooled in 1839. He then attended Clinton Liberal Institute and studied at Cazenovia Seminary from 1841 to 1845. After being admitted to the bar in 1848, Stanford moved to Port Washington in Wisconsin, where he began practicing law. In 1850, Stanford married Jane Elizabeth Lathrop. The two did not have a child until 1868, when Leland Stanford, Jr. was born. Two years later, the majority of Stanford's possessions were destroyed in a fire. Stanford sent his wife back to New York to live with her family while he went to California to find work. For a while, he worked as the keeper of a general store in Placer County, but he later worked as a justice of the peace and a organizer of the Sacramento Library Association. In 1855, Stanford got his wife and the two of them moved to California, where he got involved in large scale business, and he became one of the major investors of the Central Pacific Railroad along with Charles Crocker, Mark Hopkins, and Collis P. Huntington. Stanford soon was elected as president of the company. In 1856, he helped to organize the California Republican Party. His involvement with the Republican party earned the nomination for the state treasurer in 1857 and for the governor of California in 1859, though he lost both elections. In 1961, Stanford ran for governor again and won, holding the seat for one 2-year term. In May of 1868, Stanford and several of his colleagues formed the Pacific Union Express Company, which merged with Wells Fargo and Company, which Stanford was the director of from 1870 to to 1893 with a month-long break in 1884. Stanford also gained control of the Southern Pacific Railroad, directing it in the same way he directed the Central Pacific Railroad. Stanford, as head of the Central Pacific, was responsible for building the western half of the Transcontinental Railroad. Stanford was present at the driving of the "Last Spike" in Promontory, Utah. Stanford was president of the Central Pacific and Southern Pacific railroad companies until 1890, though he continued to be on the executive committee of the Southern Pacific Railroad until his death. Stanford was interested in ranches and horse racing. In 1872, Stanford commissioned Eadweard Muybridge, a photographer, to settle a bet on whether all four feet of a horse leave the ground at the same time when running. Stanford won the bet. 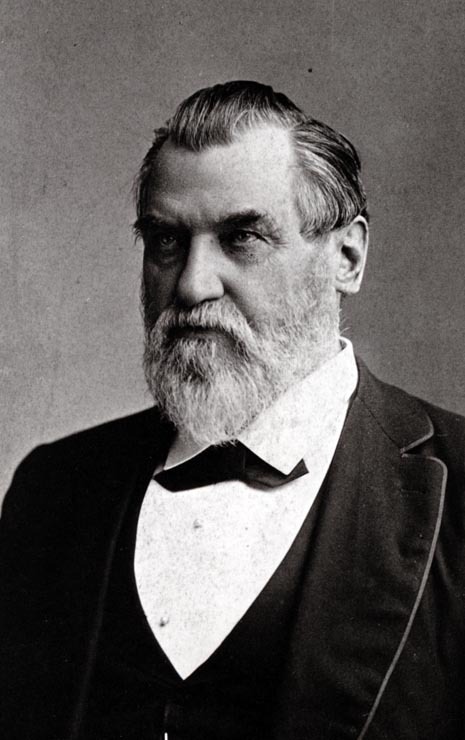 Leland Stanford helped to found the first California State University, San Jose State, in 1857. Also, in 1884, Stanford and his wife found Leland Stanford Junior University as a memorial to their son, who had died of typhoid fever while on a trip to Europe. The Stanfords donated $40 million dollars (over $1 billion dollars in today's money) to develop the Stanford, which opened in October of 1891. Stanford died of heart failure on June 21st, 1893. Stanford is on our list of people because he helped develop the economic, political, and educational systems that can be found in California and the United States that we have today.